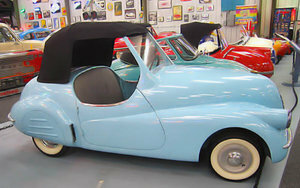 The amount of producers of the small car under the 1947 brand name Volpe (fox) out of Milan were numerous. A large-scale advertising campaign was launched to promote the stylish small car with no doors. Bodies made by the companies "Società e meccaniche Construzioni the Aeronautiche", "Società Lombarda Navigazioni le Aero", "Officine Caproni" and "Anonima Lombarda Cabotaggio Aero". The Volpe had developed and had a two-cylinder engine with a 125cc engine capacity with engineering by Colombo. The Volpe of 1949 appeared in a slightly amended version by the Italian design company Bertoni. 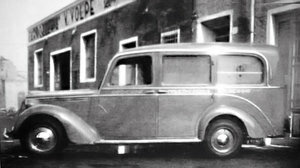 Very little more is known about this firm which also build some ambulances on Fiat 1100L and ALR chassis.